Ready or not, the global mobility trend is forcing enterprises to enable a modern, mobile workforce with business productivity tools on any device, regardless of the underlying operating system. 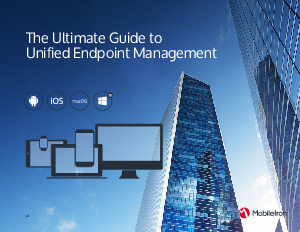 As enterprise users increasingly demand the ability to use their own mobile devices and desktops for modern work, IT is quickly impacted by end-user technology decisions. Enterprises can no longer ignore this reality, especially given the explosive global demand for mobile devices. Considering that smartphone adoption is expected to grow from 1.47 billion devices in 2016 to more than 1.7 billion in 2021, it’s clear that organizations need a comprehensive way to quickly onboard and secure a vast range of employee devices coming into the enterprise.